SMART Carpet is a convenient shop-at-home service. 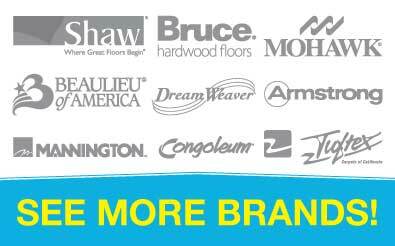 SMART Carpet offers a complete line of name brand flooring products for carpet, wood, vinyl, laminate & tile. SMART Carpet has managed to eliminate all the hassle of buying new carpet and flooring. The SMART Carpet system is simple, with everything done right in your home where color and quality selection matter most. The experts at SMART Carpet make sure all measuring is completed before clients choose from thousands of styles and colors that are available. Because SMART Carpet is a "Mill-Direct” buying service and not a store, SMART Carpet customers can save up to 50% off typical store prices. This is simply due to the fact that no expensive overhead costs are added into the price of a customer’s flooring. Almost everything is included with SMART Carpet, from the measuring and layout to the quality padding and expert installation. SMART Carpet will even move the furniture for installation purposes. Smart Carpet is a Flooring Company that Delivers a Whole New Carpeting Experience! There are many other flooring companies out there in the New Jersey, New York and Pennsylvania area that offer a wide selection of name-brand carpeting and flooring. Although, you will find that Smart Carpet does things slightly different. Our flooring company comes to you from the very beginning, and not just during the installation process. Our professional flooring associates will bring our mobile showroom directly to your home, so you can select the flooring that is right for you in the comfort of your own home. 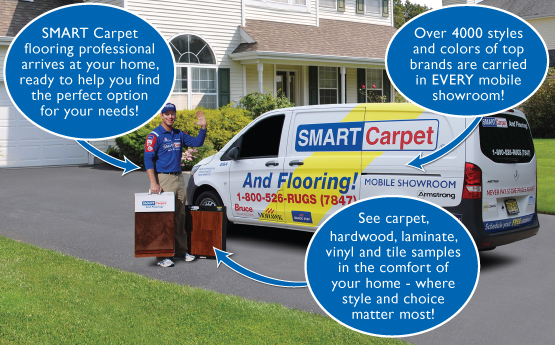 From shopping and selecting carpeting, to your actual carpet installation, Smart Carpet truly delivers! 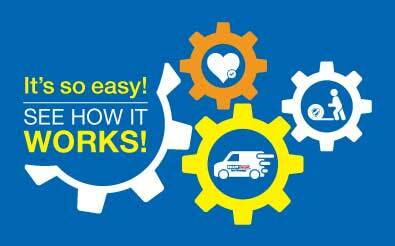 Smart Carpet: Where Our Carpet Stores Have wheels! Picking out flooring or carpeting in carpet stores can be a hassle, because the lighting may be different and can drastically change the way a sample looks in a show room versus in your home. Since our flooring company brings a mobile showroom right to your home, you can easily match the right carpeting or flooring samples to your room’s décor. Smart Carpet eliminates the hassle of shopping in stores. Simply book your flooring appointment online, and one of our Smart Carpet Professionals will bring over 4,000 carpeting and flooring products to you. Once you select your carpeting, your carpet installation will be arranged, and we even offer a superior warranty! Learn more about our innovative flooring and carpeting shopping experience! 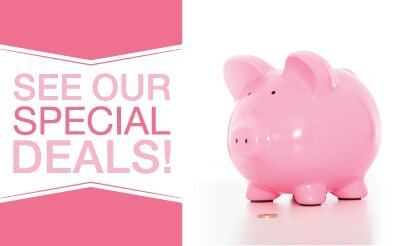 Call us today at 1-800-526-7847.